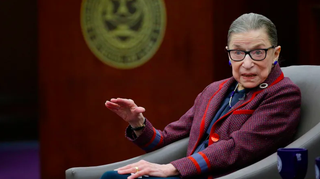 Supreme Court Justice Ruth Bader Ginsburg—who is never allowed to die, and knows it—has made her first public appearance since she underwent lung cancer surgery in December. Ginsburg left the house to attend a production of “Notorious RBG in Song,” which was created about her life by her daughter-in-law, the soprano Patrice Michaels. According to the Washington Post, Ginsburg’s presence was not announced at the event; in fact, the majority of the the audience didn’t even know she was there. Classic Ruth! Ginsburg’s recovery meant she missed her first round of oral arguments in the Supreme Court since 1993. Still, she intends to vote on the cases based on briefs and transcripts, and has continued to have a say in which cases the court accepts. While it’s clear that nothing can keep Ginsburg from doing her job, it seems unlikely that she’ll attend the State of the Union on Tuesday. That decision alone should prolong her life just as well as any bed rest.